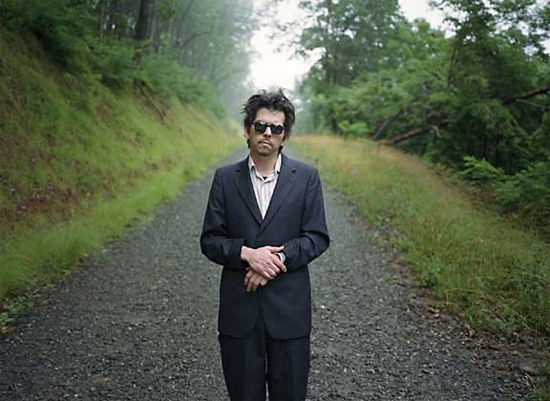 Mark Linkous took his own life in Knoxville, TN on Saturday March 6, 2010. He had been dealing with depression for a long time. The world has lost a brilliant talent and gentle soul. My thoughts and condolences go out to his family and close friends. I'll probably keep it, 'til Saturday." I think I can recall hearing Sparklehorse for the first time, it was around 1997; I was at my parents' old house sitting on a bench listening to my Discman - some magazine compilation CD, sitting on the lawn on a hot summer's day. I remember 'Saturday' came on and it just summed up the moment right there and then. Mark Linkous's fragile & gentle voice, cracked and melancholy, thinned out and distorted, as if he was calling long distance from some imaginary place, but sort of hopeful too, blissed out in the sunshine. I went out and bought Vivadixiesubmarinetransmissionplot the very next day. It was like nothing I'd ever heard, as if I'd been living in monochrome my whole life. It stayed on repeat for months on end and it still remains intact. I played it today, it didn't skip or stop once. The production of Sparklehorse's records could be lo-fi and wonderfully strange at times, veering between use of static and odd fairground noises, spliced with feedback and white noise and electronic bleeps; as if a darker side was a constant, vicious reminder of a capability for destroying any potential happiness. Ultimately, I believe it was beauty though, that overshadowed brutality in Sparklehorse's world, as like many before him, Mark was trying to make sense of his life through music. The ugliness reared it's head when obliged. (Let's not forget, Sparklehorse could rock like bastards too!) Yet there were always these unique, surreal songs that utterly seduced and then moved you to tears, like 'Spirit Ditch', 'Sea of Teeth', 'Most Beautiful Widow in Town', 'It's a Wonderful Life', 'Painbirds', 'Little Fat Baby', 'Morning Hollow', 'Shade & Honey' and 'Homecoming Queen' to name a few. Horse laughter, it's dragging pianos to the ocean"
We played some shows together a few times over the years, he was always very considerate and friendly, stooping down to say hello in that reserved, southern drawl of his, drinking a white Russian and regaling me with odd anecdotes after the shows. I started drinking white Russians as a result. For all his shyness Mark was funny too. He once wrote and left me a message with a bizarre drawing at Tarbox studios where we both worked with the producer Dave Fridmann. I believe the accident that nearly killed him in the 90s caused him much chronic pain, yet he never seemed like the complaining type, just kept to himself and continued writing those fractured, mirror-crack'd lullabies. It's hard to fathom that he's suddenly gone, his music meant, and means, so much to me. His different projects always kept me intrigued and he seemed so busy and creative recently. I do hope that even through his passing was untimely, he'll be remembered all over the world for the genius he truly was. Mark wrote the most poignant and incredibly beautiful songs I have ever heard and it was a real privilege to have met him. I will never stop listening to that CD. Mark Linkous, R.I.P. Context is imperative. You’re looking at a writer who routinely batters his ears with the most blackened metal and inhospitable noise records, rather than a habitual musical moper. But something about Mark Linkous’s gloriously fragile turn of phrase always stopped everything in its tracks. And there was no exception when news broke of his suicide last weekend. The only quiet tribute payable from many thousands of miles away was pause whatever was playing, hurriedly dig out Sparklehorse’s back catalogue, press ‘Repeat’, bite your lip and try to remember the good times. It’s quickly apparent that certain lines are almost too much to bear. The context is immediately altered, of course. The obvious tearjerkers, for example, on invitingly sparse debut album Vivadixiesubmarinetransmissionplot – ‘Homecoming Queen’, ‘Most Beautiful Widow In Town’ – still bristle with desperately downcast moments, haloed by trademark hope-in-hopelessness. The real bombshells, though, are less expected, infinitely more poignant for that fact. Given the day of Linkous’s untimely passing, try getting through ‘Saturday’ ("I’d like to tell you/ How I feel/ I’ll probably keep it/ ’Til Saturday") without leaking several tears and you’re a harder soul than us. But ‘Sad & Beautiful World’ is where it really hits home with sledgehammer effect as Linkous intones: "Sometimes days go speeding past/ Sometimes this one seems like the last." As a lasting reminder of how sadness and beauty were among his many returning themes (alongside horses, birds and death), it breaks things down to base elements with startling spine-tingling micro-shocks. Good Morning Spider is, relatively and outwardly, the most upbeat of all Sparklehorse albums, yet hides its unhappiness disarmingly. ‘Hey, Joe’ is where the Linkous family’s touching epitaph "There’s a heaven and there’s a star for you" originates. And the inbuilt loneliness of ‘Maria’s Little Elbows’ finds itself surmised via a solitary, wondrous line: "Sometimes you feel you’ve got the emptiest arms in the whole world." Moments of ‘Gold Day’ and ‘Eyepennies’, from It’s A Wonderful Life, become equal parts magical and chilling, meanwhile. The former’s dashed hopes are to "keep all your crows away/ hold skinny wolves at bay”, the latter promising to "…return here one day/ And dig up my bones from the clay" among titular allusions of travelling over to the next life. The one line that is impossible to shake from your thoughts, however, hails from Good Morning Spider, as ‘Chaos Of The Galaxy’ cartwheels its station-flitting radio dial into ‘Happy Man’. The crux: "All I want is to be a happy man." With an aching spirit so eloquently and emotively articulated, without resorting to layers of lyrical cloaking, the real tragedy is that Mark Linkous clearly never achieved that heartbreakingly simple aim.